Today I’m sharing a fun DIY gift idea that’s easy to make and can customized to fit each of your friend’s style. And with Valentine’s Day just around the corner, it’s the perfect time to let your friends know they are loved. These DIY gift totes are loaded with tons of favorite finds—everything from nail polish to Strawberry Pocky. Because who wouldn’t love a fun acrylic tote like this?! The best part is that after the items are used (and all the Pocky is gone in like 2 seconds) the totes can be reused for another purpose. They are great for displaying napkins and utensils at a dinner party or even storing paint brushes and craft paint. Get a head start on Valentine’s Day gifting and watch the video below to learn the secret to creating the Valentine’s Day gift totes! Download and print the valentines template. Cut out each template along the outer dotted lines. 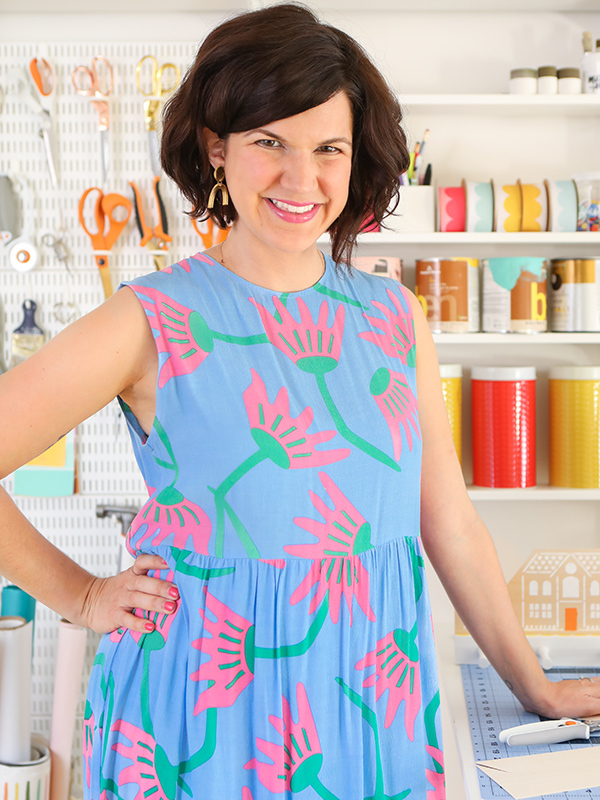 Create two loops of tape and place them on the front side of one template. Place the template on the inside of the acrylic tote. Use paint pens to trace over the design. When done, remove the template and allow it to dry completely. Then flip it over and repeat the same thing on the other side. The dotted vertical lines on each template indicates where to cut it if you’re tracing the design on the side with multiple compartments. Fill this tote with beauty essentials to give your friend a spa day. I included a foot scrubber, nail polish, bath bombs, a heart barrette, tiny canned wine (complete with bendy straws) and Strawberry Pocky. This tote is for your friend who always hustles to make her dreams happen. Fill it with practical, but pretty items to spruce up her workday. 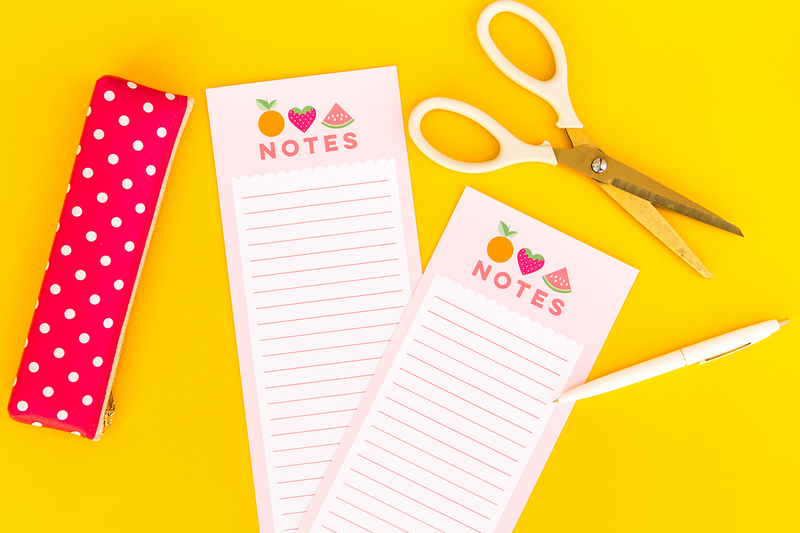 I’ve included pretty pens, notebooks, gold scissors (a must for any workspace), extra large gold paper clips, washi tape and Strawberry Pocky—because sometimes you need a work day pick-me-up. This tote is perfect for your friend who loves to entertain! It’s filled with valentine’s party essentials like heart shaped plates, a gold mini cocktail shaker, and a marble bottle opener. Finish it off with heart swizzle sticks and Strawberry Pocky, both which make the perfect garnish for a chocolate cocktail. How will you be celebrating your friends this Valentine’s Day? 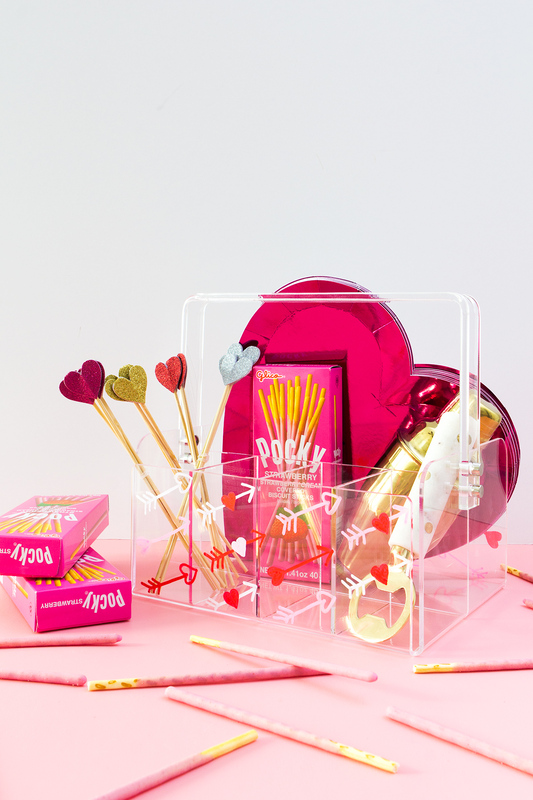 If you love all things Pocky then you’re in luck; ’tis the season for Strawberry Pocky! 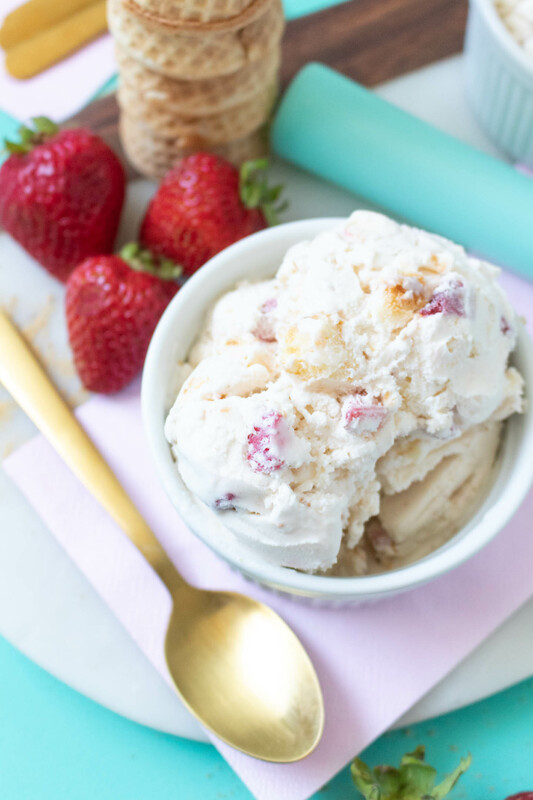 You can also gift your friends homemade chocolate Pocky pops or serve up mini no-bake strawberry cheesecakes. This is my kind of project, easy and thoughtful! I have never heard of Pocky before, but it looks yummy. These gifts look like a lot of fun to put together. Thanks for the idea! What a sweet gift idea! And I love how delightfully colorful your whole spread is. And of course I LOVE Pockys. Love how this turned out! They’re all so cute! Hey there! I&21v87;#e been reading your weblog for some time now and finally got the courage to go ahead and give you a shout out from Atascocita Texas! Just wanted to say keep up the excellent job!